Entering the backcountry in the 21st century demands responsibility. Many postcard-perfect wilderness destinations in North America are at risk of being loved to death (or at least degradation); truly remote, pristine sites are all the more precious in the context of our never-so-great human footprint. Leave No Trace (LNT) is a philosophy every outdoorsperson should adopt. Naturally, human beings are going to leave some traces in the woods—when we’re out hunting or fishing, sure, but also simply backpacking. Comes with the territory—and totally natural. But the LNT idea about aiming for as light-handed and soft-footed a touch as we can: an acknowledgment of how human-dominated the planet has become, and how valuable its less-trammeled corners are. Awareness lies at the heart of this philosophy, and as such you may well find that practicing LNT principles deepens your appreciation of the wild: You’ll pay more attention to the landscape and carry out your actions more mindfully. Adopting a LNT protocol is an ongoing learning experience, and a fun, ongoing challenge, too: Each season and setting demand their own best practices. Let’s have a look at some of the LNT basics! Responsible outdoorspeople have been treading lightly on the land for a long time, of course, but the USDA Forest Service formalized the concept of Leave No Trace in the 1960s. The code of outdoor ethics became higher-profile through the agency’s collaboration with the National Park Service, Bureau of Land Management, and the National Outdoor Leadership School (NOLS). In 1994 a non-profit—Leave No Trace, Inc., now the Leave No Trace Center for Outdoor Ethics—was established to promulgate the practice. There are 7 LNT principles, which we’ll list here and draw upon in this blogpost. We encourage you to bone up on them at the LNT Center for Outdoor Ethics website as well. The LNT approach begins before you hit the trail. Consider the size of your party, for instance. A larger group will, all else being equal, have a greater impact on the landscape than a smaller one. Of course, weigh the trip-specific benefits of a particular group size against these LNT concerns. Packing, too, makes a difference LNT-wise. Keep packaging to a minimum: That’ll keep the potential of littering to a minimum. 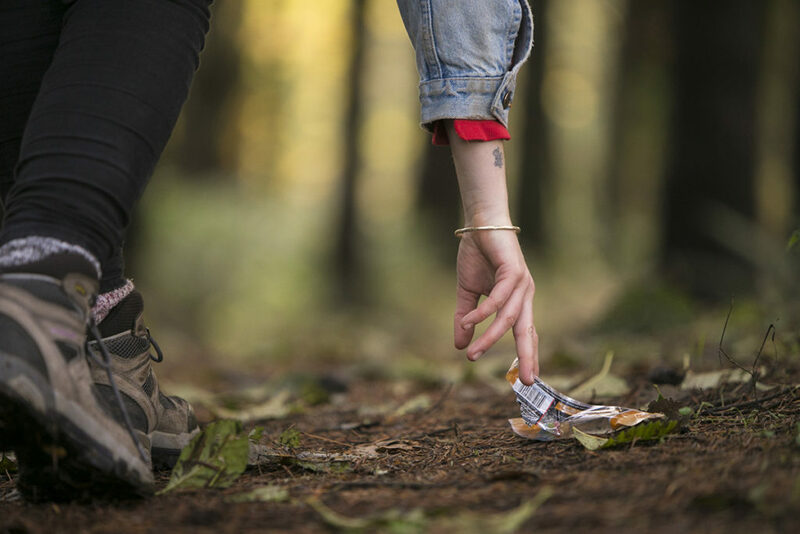 And speaking of, bring along a bag for collecting any litter you run across in the backcountry—every little bit of cleanup helps. Don’t forget the Ten Essentials and any additional necessary safety supplies, of course. If you end up in a tricky situation and require bailing out, the rescue effort will inevitably have an impact on the environment. Obviously emergencies happen and your well-being is first priority, but treat this as just more reason to have basic wilderness-contingency equipment on hand whenever you head out for adventure. You should also think about contacting the agency responsible for managing the land where you’ll be recreating and inquire about any specific LNT concerns attached to it: especially sensitive habitats, areas closed for restoration, etc. You might not think your hiking boots could pack much of a punch out there in the wildlands, but they can—and all the more of one when combined with countless other pairs tromping up to mega-popular mountain lakes or waterfall overlooks. Stick to established trails whenever possible. Bushwhacking’s wonderful, but save it mostly for trail-less country rather than well-traveled places laced with paths. And when we say “stick to the trail,” we mean it: Be faithful to the tread, even when it means slogging through a mudhole or clambering over a fallen tree (or four). Enough hikers taking a detour, and a new side-path is liable to become established, destroying vegetation and eroding soil. You’re probably familiar with the sight of rough shortcuts blazed out on the inside of switchbacks, but resist the temptation to take (and make) them. It’s remarkable how barren and rutted these bends in the trail can become over time as impatient folks cut corners (literally). Hike single-file on trails to help maintain as narrow and well-packed a tread as possible. When you are off trail, by contrast, spread out your party so that no single cross-country route gets too hammered. Trekking off-trail requires strategic, moment-by-moment LNT awareness to account for the relative sensitivity of different plant communities. Bushwhackers should favor snow, sand, gravel, talus, bare rock, and other non-vegetated substrates. (In the American Southwest, though, learn to recognize—and avoid walking on—fragile biological soil crust.) In general, grass tends to be hardier underfoot than forbs or woody vegetation. Try not to hike through wet meadows or lakeshore reeds/sedges. Whether the herb beds of a subalpine forest or the wildflower gardens of timberline parks, minimize trampling of high-country groundcover, which after all has only a smidgen of a growing season in which to do its thing. The same advice about traveling on durable surfaces and keeping off sensitive groundcover applies (and then some) to camping. A poorly situated and maintained campsite can really degrade a particular microsite and leave marks that may last years, even decades. Your approach to LNT camping should definitely be situational. In many backcountry areas, primitive campsites established long ago exist, and in general you should use them instead of founding new ones. This may often be the best practice even when one of these existing sites lies closer to waterways and trails than the recommended 200-foot buffer. When trying to minimize our collective footprint out in the wilderness, it usually makes sense to use the footprint already there rather than expand it. If you are adopting an existing user campsite, don’t be surprised to find evidence of less-LVT-savvy campers who’ve come before. In that case, be a Good Backwoods Samaritan and pack out the trash. When you’re ready to move on, do your best to return the site to its pre-camp condition: sweeping away footprints, for example, and covering tamped ground with leaf litter, duff, or other available natural materials. Campfires are awesome and have their time and place, but they also have some obvious impacts: consuming gathered fuel, emitting smoke, leaving behind charcoal residue. Many LNT devotees forgo wilderness campfires and go the lighter-touch route with a camp stove. You can clean cookware and dishware quite effectively with hot water and elbow-grease scrubbing alone. (You can obviously give your camping pots and pans a deeper cleanse when you’re back home.) If you do want soap on hand for certain cleanup jobs, choose a biodegradable variety and use small amounts at a time. After straining out food particles (which you’ll pack out), dispose of washwater at least 200 feet from water sources (and don’t pour it right on plants, you hear?). Now to the subject of, err, doing your business. Again, toilet sites should be 200 feet-plus from water and trails. Try to pee on rock or dirt rather than herbage; in snow, concentrate it in one spot and then cover the yellow with the white. When it comes to solid waste, you should either bury it in a cathole 4 to 8 inches deep or (better yet) pack it out, double-bagged. (Burying No. 2 isn’t appropriate in snowdrifts or mineral soil.) Pack out toilet paper, or reach for a natural substitute instead: leaves (not the poisonous kind, mind you), smooth stones, or snow being some promising options. Don’t Forget: You Can Reuse and Recycle Your Mountain House Pouches! We really hope it goes without saying, but please pack out your Mountain House pouches from the backcountry. They needn’t be simply thrown away back home, either: You can creatively reuse them, another, broader way to lighten your environmental footprint. Or, you can recycle them for free through our partnership with TerraCycle! A Mountain House pouch can serve as a readymade container for washing dishes, or for storing small items such as matches, maps, or snacks. Give wildlife their space: Don’t crowd or pursue animals for a closer look or a photo. A creature spooked into flight by your too-close presence, or even just put on edge and therefore not feeding, is expending precious energy in the game of survival. Be cognizant of your noise level: Being too loud disturbs wildlife (and, of course, detracts from the wildland experience of any other outdoor recreationists within earshot). Balance this overall dedication to quiet with safety concerns: You should make plenty of noise in bear country. Want to really up your LNT game? Consider taking an instructor-led course in the field. Find out more at the LNT Center for Outdoor Ethics or NOLS websites. This entry was posted in Nature and tagged backpacking, camping, hiking, leave no trace, outdoors by Kelli Martinelli. Bookmark the permalink.